Success Convent Hr. Sec. 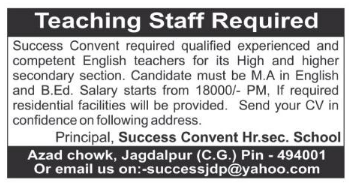 School, Jagdalpur has advertised in the SAMBAD newspaper for recruitment of Teachers jobs vacancies. Interested and eligible job aspirants are requested to apply immediately from 12th October 2018. Check out further more details below. About School: Success Convent is an educational institute which aims at the all-round development of a child. Our system of schooling plays as an important development tool for the students. We, however, understand the importance of thorough teaching so we facilitate quality education so as to make the child get appropriate returns in his future. How to Apply: Interested and eligible candidates are requested to send CV, copies of certificates / testimonials and recent PP size photos to the email address or postal address provided here.